Prevention:Vaccination. Also prevent the introduction of ILT and other diseases onto your premises. Avoid moving any birds onto or off your farm during an ILT outbreak. Do not visit other poultry farms, fairs, auctions, or exhibitions during an ILT outbreak. Treatment: Some relief from signs is obtained by keeping the birds quiet, lowering the dust level, and using mild expectorants, being careful that they do not contaminate feed or water. 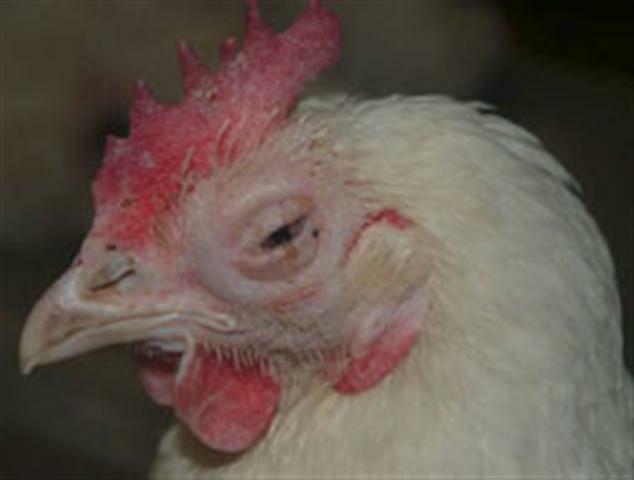 General Signs:Chickens suffering from a mild form of ILT usually have swollen; watery eyes (conjunctivitis), swollen sinuses, and a persistent watery or mucoid nasal discharge. These clinical signs are similar to other respiratory diseases of poultry. Chickens with a severe form of ILT exhibit labored, open-mouth breathing, frequent sneezing, and violent coughing, often accompanied by bloody mucus. These chickens will usually shake their heads to clear the mucus from their nose and mouth, resulting in bloodstained mucus on their feathers and on the walls of the chicken house or shed.